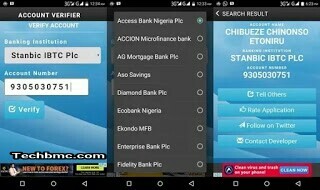 A talented Nigerian developer just developed an awsome android app that helps all in verifying bank account number and also to be used in checking account details from another account holder. Isn't that nice? This very app works with all Nigerian banks you can make mention of and same time, it's the type that is very simple and easy to use. 3. This app helps you to avoid sending of money to the wrong bank account. 4. No need to visit customer care anymore for account verification since that can be done with the app. 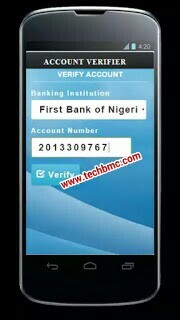 To Download this Nigerian Bank Account Verifier Apk Android App, Click Here. It is assumed you have downloaded the app, now install and launch it on your Android phone. After that, now choose the bank nam you wish and Enter a 10 digit Nigerian Bank account. Then click on where you see verify in other to know who owns the account number. That's how it works. Guide On How To Open A US Bank Account and Get the MasterCard in Nigeria. How To Recharge Your phone Number Directly From Your FCMB Bank Account. real and dubious account is made possible. Although, the app is introduced newly on Google play store with few downloads made already as many are yet to be aware of it. So today, it is made known to you by TechBmc and the question is, are you gonna use it?